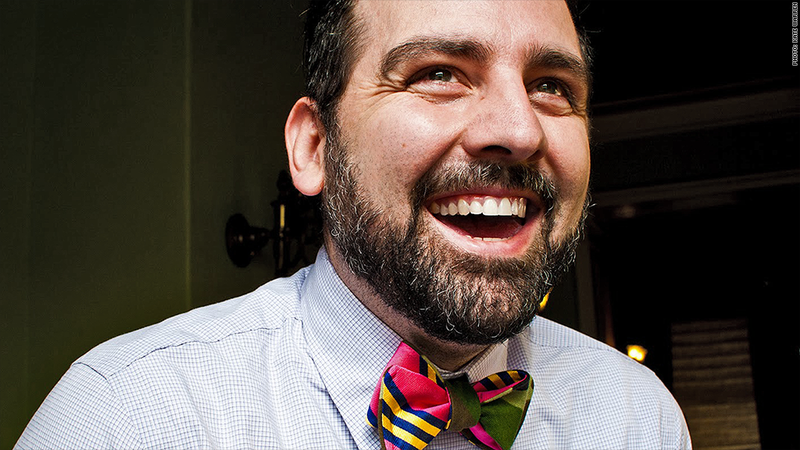 Eliot Payne started sewing his own bow ties and eventually turned it into a business. When Eliot Payne was an attorney at the U.S. Patent Office, he paid $5 for a bow tie at a flea market. "I got compliments every time I wore it," he said. "But when I looked [around], I didn't see any I really liked. They were very traditional looking, mostly striped or patterned silk." So he started making his own on his girlfriend's sewing machine. "First, I had to teach myself how to sew," Payne said. He sought out unique materials like "small batches of cloth with unusual textures, like ultrasuede, and some vintage fabrics." Sales of old-school neckties have shrunk as workplaces get more casual, but bow ties "have become a fashion statement," said Lauren Rothman, head of Washington-based consulting company Styleauteur and author of Style Bible: What to Wear to Work. "Guys in their twenties and thirties, especially, want to wear something to the office that shows off their personal style." Though Payne started sewing his own bow ties in 2009, he didn't start Accoutre until a few years later, and even then, it was a side gig. But in early 2013, Payne lost his job as part of the government's $84.5 billion spending cuts and suddenly he had a lot more time to devote to his business. At first, Payne's marketing was up close and personal: He'd carry an extra tie in his pocket and give it to anyone who asked about his own. "People would come up to me on the street and say, 'Can you teach me how to tie one of those? '," he said. "Showing people how was great word-of-mouth advertising." It helped that Accoutre's fabrics and patterns are a far cry from their stodgy forefathers: One of the bestsellers is a leopard-print tie dubbed "Bad Kitty." The company's D.C. base also made it stand out against competitors. "There are so few fashion companies [in D.C.], said Payne. "If you have one, you're kind of a local celebrity." These days, Payne sells his bow ties mainly through Accoutre's website for $60 to $70 apiece. Payne still makes all the ties himself -- "I tried hiring people to do it, but that didn't work out" -- and, while he declined to give revenue or profit figures, he said sales have more than tripled in the past three years. Payne is now teaming up with menswear blogger Paul Beirne to start a new line of men's suits. To be called Paul Eliot, it's aimed at the same style-minded crowd that has flocked to Accoutre's bow ties (and will be largely funded by cash from the existing business). The new line is scheduled to launch next fall. "It won't be a traditional suit. It's a lot more unstructured and casual," Payne said. "Paul and I both wanted to design something with some edge to it -- something that we'd like to wear ourselves."